Hundreds of people from more than 18 states have converged at Creech Air Force Base for an event organized by the peace group CODEPINK coined #ShutDownCreech to protest the flight of killer drones from the base. Activists have created 100 tombstones with the names and ages of children murdered by US drone strikes in Pakistan and Yemen. These will be displayed along the Drone Victim Memorial Highway, aka Route 95, that runs by Creech AFB. Today activists will participate in non-violence training, in preparation for tomorrow's civil resistance action. They plan to halt business as usual, and SHUT DOWN CREECH AFB to express their outrage at the atrocities committed by the illegal drone program. A memorial ceremony will take place at 8:00 pm this evening with coffins, banners, white masks and funereal attire. Activists will position themselves at the entrance to Creech AFB and read the names of drone victims. "Activists are anticipating arrests with the charge of trespassing during their nonviolent protests tomorrow. How dare they accuse us of trespassing, when the very nature of the drone assassination commits lethal trespassing and terrorizes communities all over the world. 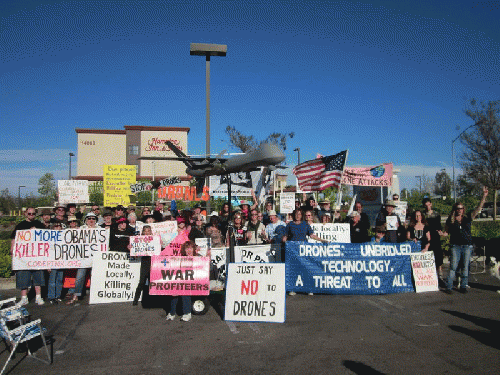 Drones Make Enemies," said Martha Hubert, one of the organizers from CODEPINK.